A horizontal line shows the constrained model without the term; a slanted line shows the unconstrained model with the term. The plot shows the unique effect of adding a term to a model assuming the model contains all the other terms and the influence of each point on the effect of term hypothesis test. 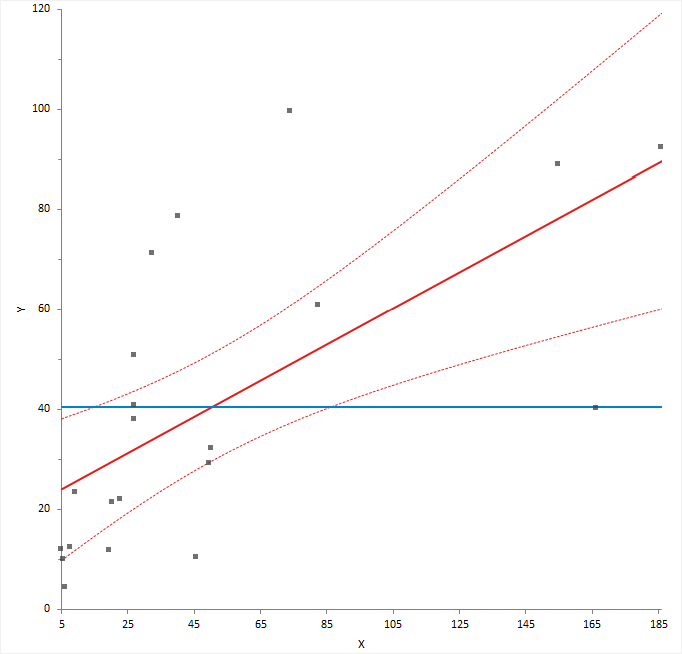 Points further from the horizontal line than the slanted line effectively try to make the hypothesis test more significant, and those closer to the horizontal than the slanted line try to make the hypothesis test less significant. When the confidence band fully encompasses the horizontal line, you can conclude the term does not contribute to the model. It is equivalent to a non-significant F-test for the partial effect of the term. You can also use the plot to identify cases that are likely to influence the parameter estimates. Points furthest from the intersection of the horizontal and slanted lines have high leverage, and effectively try to pull the line towards them. A high leverage point that is distant from the bulk of the points can have a large influence the parameter estimates for the term. Finally, you can use the plot to spot near collinearity between terms. When the terms are collinear, the points collapse toward a vertical line.